The Ideal brand has been around for around for over 100 years, but has just recently became a real contender in the market and is the 2nd most popular boiler brand in the UK. Ideals popularity is on the rise due to great value deals like the one we’re offering enabling customers to get a bit more for their money. The Vogue, is Ideal’s premium range, which means it’s built with premium components rivalling the likes of Worcester Bosch and Vaillant for build quality. The Vogue range also offers larger outputs and longer warranties giving customers more value for money. Another benefit to this range is that they are really quiet and have been awarded the Quiet Mark! What’s not to like? Happy New Year for 2018!! We hope you have a warm start to 2018! Boilers keep your home nice and warm by heating radiators and giving you hot water for your kitchen and bathroom. When you install a new A-rated boiler you can save money on heating your home because they are more than 90% efficient. In comparison, G-rated boilers can be less than 70% efficient, meaning that for every £1 you spend heating your home, around 30p is wasted. As well as being more efficient, all modern boilers are also condensing boilers, which mean they also recover heat from the hot gases that escape in the flue. Greenhome Heating sells both regular and combination boilers. Regular boilers store hot water in a storage cylinder, and may be a better option if your home needs lots of hot water, whereas combination boilers give you instant hot water without a storage cylinder, saving space. 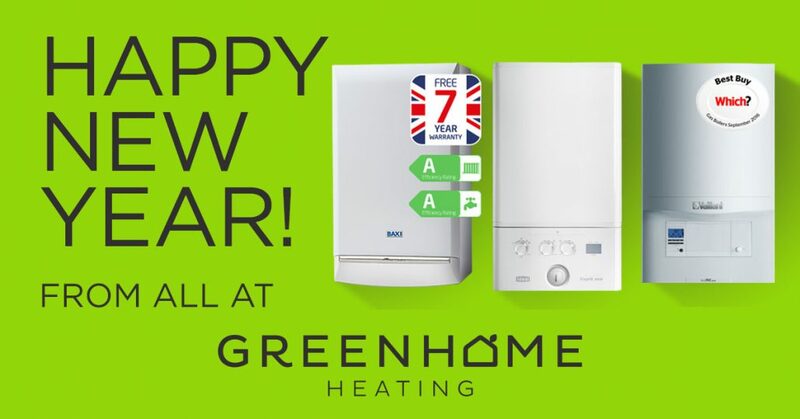 http://greenhomeheating.co.uk/wp-content/uploads/2017/12/greenhome-heating-logo-header2.png 0 0 dodio http://greenhomeheating.co.uk/wp-content/uploads/2017/12/greenhome-heating-logo-header2.png dodio2018-01-04 14:04:052018-01-05 13:14:05Happy New Year for 2018! !